Confident handling and rapid rolling cross-country MTB performance. 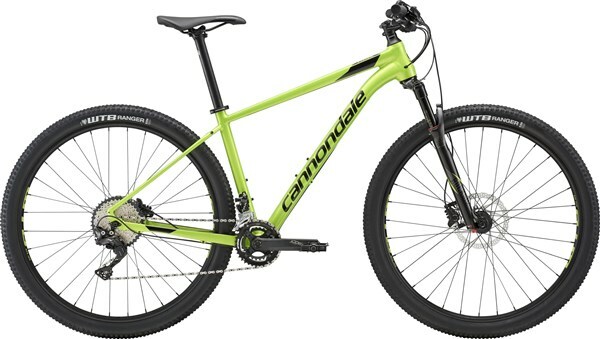 The Cannondale Trail 1 27.5” is a hardtail mountain bike that features progressive geometry and high-end features for a fast and efficient ride. The 27.5” wheels on this small size Trail are ideal for smaller riders and offer the ideal balance between nimble handling and rapid rolling performance with a great fit. Larger riders will prefer the fit and performance of the 29” version of the Cannondale Trail 1 which is available in Medium, Large and X Large sizes. The RockShox Reba RL fork delivers 100mm of plush suspension travel with accurate steering control on the trail. The remote lockout switch allows you to firm up the suspension for more efficient riding on smooth terrain. The Shimano XT/SLX 2x11 speed drivetrain is combined with an FSA Comet MegaExo chainset to give you slick, reliable shifting with a wide range of gears for taking on all the climbs on the hill. On the descents, the Shimano Deore hydraulic disc brakes give you confident all-weather stopping power. The Cannondale Trail 1 27.5 combines confident geometry with dialled spec so you can ride faster. Cassette: Shimano SLX, 11-42, 11-speed.